Dreaming about worms is generally an unpleasant experience. Unfortunately, the meaning of this dream does not improve the situation very much. When you dream about worms, it typically shows that you are arguing with enemies. It may warn that your physical health may come under attack from an illness. At the same time, there can occasionally be positive meanings to dreaming about worms. In nature, germs are responsible for keeping the soil fertile. Because of this, they may represent the fertility of the soil, rejuvenation, health and new growth. They help Mother Nature cycle nutrients and waste from the soil. In some cases, dreaming about worms can show that you are transforming your life and rejuvenation is possible. What Does It Mean to Dream About Worms? The meaning of your dream about worms can depend significantly on what happens in the dream. Worms can show that you should persevere toward your goals because tough times are ahead. By persevering, you will be rewarded and will emerge unscathed. If you see many, many worms in your dream, it may show that there are arrogant people near you. You have to be careful in financial dealings because your enemies may be trying to steal from you. If you see just one worm, it means that a friend will help you when you need it and did not expect it. A single worm in your dreams may also represent someone new coming in to your life. Stepping on a worm shows that you will push your closest friends away if you do not make changes. Meanwhile, using worms for fishing shows that success is about to arrive in your life. When you see worms in your food, it is generally not a positive sign. This typically means that someone at your work is jealous about your success or position. They will not stop in their attempts to beat you. They may question the quality of your work or your integrity to take you down. Be careful! Eating worms is not a pleasant experience in real life or in a dream. Luckily, this is actually a good sign in your dreams. It shows that you will achieve whatever you are trying to accomplish. The people around you will respect you and praise you for your achievements. If you dream that one or more worms is crawling through the grass, it means that there will be a hostile situation at work or at home. You should be careful and notice if something is upsetting a person near you. Otherwise, they may direct their aggressive, angry outburst toward you. Earthworms generally means something about your personal relationship with someone else. It may mean that there will be a major change in your relationship, or new possibilities will develop. This type of dream can also mean that travels are in your future. If there are worms crawling on your body in the dream, it shows that you have an inner desire to achieve financial or material prosperity. Unfortunately, you may be struggling with your goals because they are not within reach right now. If you brush the worms off of your body, it may mean that you are not interested in getting material or financial prosperity because you would rather focus on non-material things. Silkworms are a positive symbol in your dreams. They show the connections or strings that link you to other people. Your connections are strong, so you are able to rely on these connections for support whenever you undergo hardship. As long as you return their support, the relationships will remain strong. 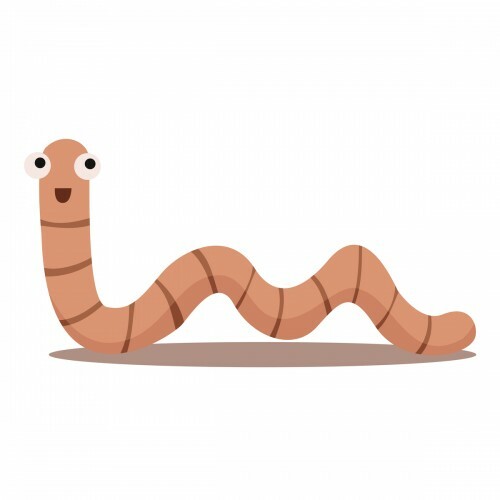 Women who dream about crushing worms shows a potential for distress from unwanted attention. The best way out of this problem is to politely refuse their advances. You have to be direct though because they will not realize you are truly not interested otherwise. When you dream about fishing with worms, it shows that you are being pulled into a routine. You may be dressing too boringly, or you may be stuck in the same rut during your daily life. Sometimes, you need to make changes to grow. Even if you just cut your hair or buy a new jacket, it may help to change your life for the better. Worms are often connected to decay and dirt. They are also a symbol of fertility and rejuvenation. In your dream, the worms emerging from the body may show that a certain event is forcing your suppressed feelings to emerge. Those feelings may be good or bad because it depends on where they are emerging from. Worms out of your eyes shows that your perspective is negatively skewed. Worms from your ankles show that you have a distaste for the material things of the world. I just had a dream that tiny little worms were crawling on my head and I started screaming out for help and freaking out. Yelling the names of various people that I’m friends with and also family. What does this mean? Also I woke up at 3 am after this dream. The specific meaning of worms in your dreams is explained in this article. Their presence in your hair could be an indication that something is on your mind. Your fear in the dream is a manifestation of your fears or concerns in your waking life. You attempted to get help from your family and friends, which is a sign of your emotional and social relationship with the people in your life. Ensure that you share your kindness and compassion with everyone in your life. Have a great day, Lizzy! I had a dream that I was standing in an unknown bathroom & I felt something at the back of my throat. when i reached in, I pulled out a handful of black/brown worms and threw them on the floor. after that, i felt a few more in my throat and spit them out until they were all gone. weird dream. what does it mean? Worms in dreams can be best understood in this article. Often, worms seem to be manifestations of fears, death, or rebirth. Since they were in your throat, this may be a sign that the words that you communicate with others may need to be changed. Ensure that you share your kindness and compassion at all times. This may help reduce the frequency of similar dreams manifesting in the future. Have a great day, Arey! Hi, I just had a very strange dream recently and I cant seem to find an accurate answer. I had two animals in my dream, first i dreamed of a white spider-scorpion, that out of fear i was trying to kill. But along the tail of the body there were tiny black markings, like tattoos. Later i dreamed of a large spiked worm that was trying to harm my child, so i killed it. Your dreams are reflections of fears or concerns that you many have in your life. It is certain that you will benefit from abstaining from consuming violent and dramatic media. Ensure that you share your kindness and compassion with everyone in your life. If you have similar dreams in the future, then address whatever is attempting to harm or chase you. Have a great day, Sylvia! I had a dream I was going to the bathroom at my parents house and when I got up and looked in the toilet, I saw a handful of tapeworms and was disgusted. Then I started to vomit many tapeworms from my body and then saw them crawling all over my parents living room floor and my mom said “she told my dad about them but”. I’m worried because all other sites say pooor health!! I’m 27 and in great shape and health!! Help! Your dream could be a manifestation of various concerns in your life. There may be something in your life that you feel is parasitic, and that may not be part of your body. Determine what you want for your future. If there is something that you believe you would benefit by removing it from your life, then make a decision about your future. Ensure that you continue to share your kindness and compassion at all times. Have a great day, Worried! The specific meaning of worms can be found in this article. Your attempted consumption of the worm could be a reflection of your relationship with whatever the worm represented in your life. You spit it out, which is a sign that you were either disgusted or no longer wanted to harm the worm. Allow this dream to guide you to share your kindness and compassion with everyone in your life. Have a great day, Soph! I had a dream that I was having lunch with coworkers and friends on a large picnic type table inside what seem like a food court. After a while, an old high school friend showed me small white thin worms moving on her pasta plate. She mentioned she got the pasta at Barnes and Nobles and had complaint but they had not responded to her complaint, and kept eating it because it was good. After, after I continue to talk to her and other friends about work and we walked out of the place together. Your dream could be a reflection of your concerns regarding food. It is possible that you are worried about the food that you and your friends consume. Barnes and Nobles could be a reflection of your hobbies and interests. The specific meaning of worms can be found in this article. Ensure that you allow the negative aspects of this dream to fade, and share your kindness and compassion with everyone in your life, as this will bring you many benefits in the future. Have a great day, Patty! Thanks you for your help ! The specific meaning of worms can be found within the article. The presence of the worm in your ear may be a manifestation of its meaning in your mind or in your ear. It is possible that you heard about something recently with has been influencing your mind. Allow this dream to fade, and ensure that you share your kindness and compassion with everyone in your life. Have a great day, Lisa! Hello ! , I dream of a “long worm going inside my ear” , then i woke up quickly because i dont like the sensation of the worm moving to go inside my ear. Hi, I dreamt that I was bleeding heavily though my nose and together with blood, I saw a young earthworm with it. Please can you tell me what that mean? The specific meaning of the worm may be described best in this article. It is not uncommon for blood and worms to be associated with each other. You may have nosebleeds in your waking life, and the worm could be a sign for the potential cause or reasons for those nosebleeds. You will find great benefit in sharing your kindness and compassion at all times. Have a great day, Christina! Had a dream about worms. Worms were falling into my room from the wall, initially they were dropping one after the other. When they fall into the room, they quickly crawl away for cover. After a few minutes, a “mountain” of worms just dropped at the same time. Please what does this mean? Worms are reflections of change and decay. It is possible that you may be thinking that something in your life is decaying or altering. The amount of worms in your dream could be a reflection of your knowledge of death, which is also a sign of change. You will find great benefit in determining what you want for the future. You will find great benefit in sharing your life ness and compassion with everyone in your life. Have a great day, Jane! Hi, I dreamt about worms also. First I felt that something is crawling in my head and I have found out that those are worms and what I did I looked for vinegar and put it on my head and successfully I get rid of them and saw it fell on floor coming my head. When I saw those worms I crushed them and kill them. What does it mean? The worms may be a reflection of your sense of decay and change. You are aware that you will eventually die and your body will be subject to natural processes. Your decision to harm the worms may be a sign that you are unhappy with this knowledge. You will find benefit in taking this time to determine what you want for the future. Make whatever decision will make you feel comfortable and happy with the future. Have a great day, Jen! I had dream about worms crawling on my hair, I try to get rid of them but they kept multiplying. The specific meaning of worms is in this article. Their presence in your hair could be a reflection of your concerns regarding your thoughts and concerns. Their multiplication could be a sign that your worries are growing. Ensure that this dream guides you to reduce the stresses and influences in your life. Share your kindness and compassion at all times. Have a great day, Nancy! Thank you for sharing your supportive comment. Please share more of your thoughts and feelings in the future. Have a great day, Anna-kay! Wow! I think you got it right! I’ve been surpassing this feeling of vengeance for years now and I thought it’s gone but recently, something has happened to me which got me really angry, then this old me feels like it’s back. This dream is a reflection of your influences and thoughts. Negative emotions and thoughts are not beneficial, so allow them to fade. Ensure that your actions are filled with kindness and compassion. This will bring positive energy and people into your life. Have a great day, Vincent!